Welcome aboard the Belmond Royal Scotsman, a luxury train in Scotland that is your impeccable host for a spectacular journey into the beautiful Scottish Highlands. This is travel the way it was meant to be: luxurious, leisurely and full of discovery. A journey on Belmond Royal Scotsman (sister train of the Venice Simplon-Orient-Express) is regarded as one of the great travel experiences. You'll be taken into the heart of Scottish history on an exclusive round trip where you'll enjoy exquisite hospitality in castles, distilleries and great country houses. So sit back, relax and let the staff of the Belmond Royal Scotsman look after your every need. Your journey on board this luxury Scottish train offers exclusive visits to romantic castles, distilleries and private homes. Feast on gastronomic delights, prepared on board using the freshest local ingredients and accompanied by fine wines, served in one of the two Dining Cars. Unwind in one of the most unique spas that Scotland has to offer, on board Belmond Royal Scotsman. Two serene treatment rooms provide a haven of peace, while an exceptional menu of all-natural therapies work to rejuvenate body and mind. Simply sit back, relax and let the therapists indulge you as the beautiful scenery glides by. 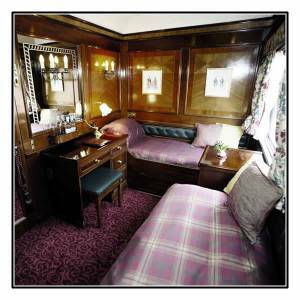 Dining on board this luxury train in Scotland is an exquisite experience. The fixed menus reflect the seasonal changes and are consistently regarded as the best in any hotel in the world. The extensive cellar provides a range of fine wines to accompany lunch and dinners, and a fine range of liqueurs and malt whiskies are offered. The choice of a full Scottish cooked breakfast or a Continental breakfast is available every morning. 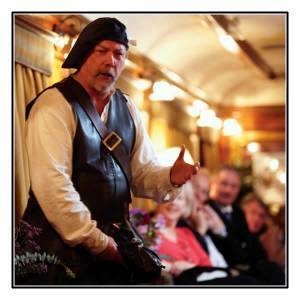 After dinner, relax with a rare scotch malt whisky in the stunning Edwardian Observation Car as a local Highlander regales you with stories of life in Scotland in centuries gone by. Then, retire to your mahogany-adorned State Cabin, with private facilities, for a peaceful night's sleep as the train slips quietly into a siding where it stables for the night. There are a variety of rail journeys available on the Belmond Royal Scotsman, from one to seven nights in duration. You'll travel through some of the most breathtaking scenery in Europe. Travelling at a leisurely pace, so you miss none of the splendour outside your window, you'll wind your way through beautiful glens, around stunning lochs and along mile after mile of unspoilt coastline. Of course, there are stops along the way; a chance to experience Scotland at first hand, with hospitality at a number of exclusive destinations. 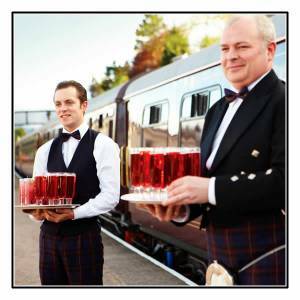 "When it comes to sheer glamour, no ride on rails compares with a trip on the Belmond Royal Scotsman"
This luxurious Scottish train is exclusive and intimate accommodating a maximum of only 36 guests in wonderful State Cabins, all with private facilities. Once on board, you'll find a level of hospitality and personal service that's all too rare in the modern world. From the moment you arrive, to the time when you, sadly, have to leave, you'll want for nothing. Except, perhaps, a chance to do it all again. All prices are per person and are fully inclusive of accommodation, meals, alcoholic and non-alcoholic beverages, entertainment and off-train visits, as well as the services of your on board host; there solely to make your journey more enjoyable. Treat yourself to a memorable luxury train journey in Scotland aboard The Belmond Royal Scotsman and experience the very best of this wonderful country in world-class luxury.